OLD TOWN SPRING ART SHOW! I have been very busy of late. 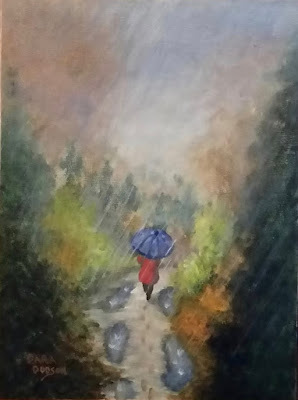 First I am teaching another six-week acrylics class. Second, I am getting ready to be the featured artist at OCEAN ART GALLERY for the month of March. Third, as part of being the featured artist, I am giving a demonstration of fluid acrylics on March 10th. Fourth, I have been trying to get juried into the OLD TOWN SPRING ART SHOW. Whew! I'm tired just saying all of that! Each one keeps me busy, but all four at once is crazy! But, so far, so good, as they say. The class is smaller this time, so its easier to teach 8-9 people rather than 12 or more. I am really busiest getting enough paintings done to have for both the art gallery and the Old Town show. The gallery wants me to fill a 12 x 20 room with paintings. At least one wall has three openings, so I will just have one stack painting between each opening. However, across from that is a solid wall that will hold quite a few paintings. The owner asked for 3-4 large (36 x 48) paintings, and at least 15 smaller paintings. This gallery show is being called "Ocean and Palm Meditations." The large paintings are the "Looking Up" series of palms, and all the rest are "Ocean Meditations" paintings. 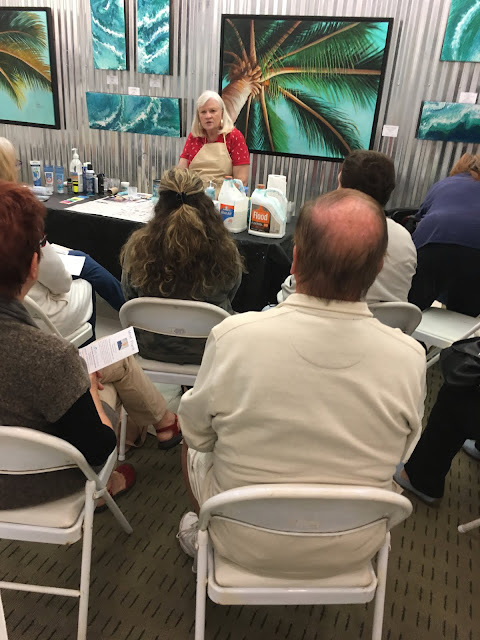 Hence the demo of pouring or fluid acrylics. I will go into that more after it occurs, ok? 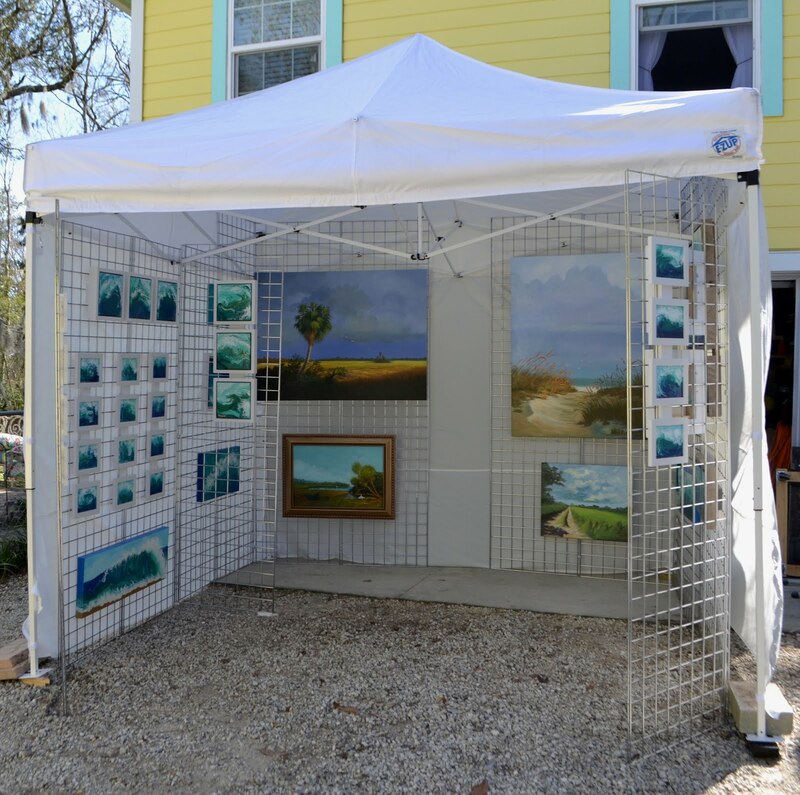 As for the OLD TOWN SPRING ART SHOW, each participating artist must be juried into the show. That entails filing an application and fee, and sending photos of your artwork and a tent setup. Each tent is required to be white, and the display panels that hold the artwork must meet the criteria. I chose to go with metal grid panels. They are used in the photos of the Art Show website, so I knew they were acceptable. They are also lighter weight than some professional carpeted panels (which can also cost $2000!) On top of that the photo of the setup MUST show your tent completely set up including art hung just as in the show. That is a half-days work right there! But it all paid off. I was juried into the show! Now, I must pay the booth fee ahead of time. Not cheap, but not extremely expensive either. One piece of artwork sold will cover it. The expense is for the long term though. There are three shows per year here in our area. One in St. Augustine, FL in March, and one in Jacksonville Beach, FL in October. 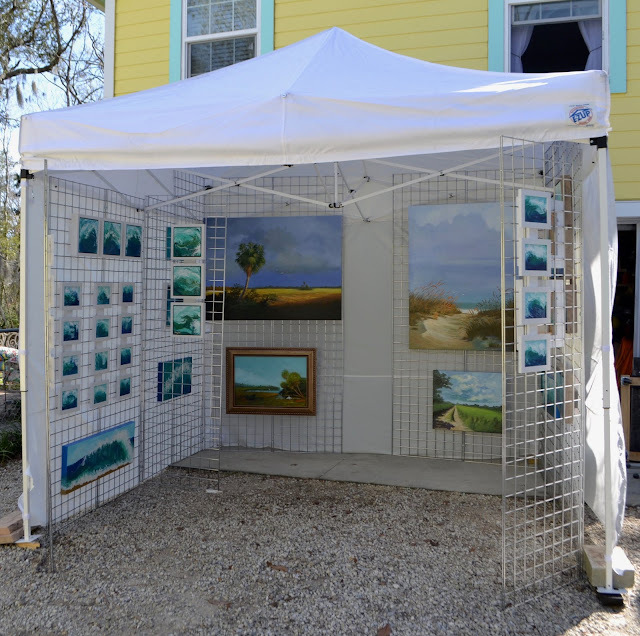 There is another show in St Augustine in November sponsored by the St. Augustine Art Association. I haven't yet decided if I will try for that one. I think I will wait and see how the show in March goes. Below I have a photo of my tent set up for the jury process. I will do another post after the show with photos and my comments on how it went, along with any interesting experiences. An interesting note is that the application process is through ZAPPlication.com, a large group that handles applications/calender for these shows. The website goes into detail of how these are conducted, juried, and most interestingly, the many locations and times these are held all around the United States. There are HUNDREDS of locations, and they are year round! Amazing! A person could make a career of just following/selling at these shows and traveling the country. Travel and sightsee during the week and do the shows on the weekend. What a life that would be! I can see it now, get one of those big campers that have garage space in the back for off road vehicles, and use that space for your tent and paintings. You'd be ready to go! Thank you for looking at my posts and please keep looking!